“It is the position of investigators that this business was a pyramid scheme that over time evolved into a straight Ponzi scheme in which new victims were recruited to stave off requests for withdrawals and complaints from older ones.” — Royal Canadian Mounted Police, July 17, 2014: Source: Affidavit that shows the RCMP, the Toronto Strategic Partnership and the Toronto Police Services Financial Crime Unit are involved in a criminal probe of Banners Broker. How to begin the brainwashing process: Screen shot from page of court exhibit in Canada. Members of the TelexFree MLM “program” allege that racketeering occurred within that enterprise, described by U.S. regulators earlier this year as a billion-dollar, cross-border pyramid- and Ponzi scheme. The Zeek Rewards MLM “program,” alleged to have gathered on the order of $850 million before is August 2012 collapse, launched after the 2008 collapse of ASD. There can be no doubt that TelexFree, Zeek, ASD and Banners Broker had promoters in common. There also can be no doubt that “see no evil” MLM cottage industries sprouted up around these foundationally corrupt “programs” and offered services such as “lead” provision and “ad” placement. Victims have piled up in such numbers that, in the TelexFree scam alone, 20,000 Greyhound buses with a 50-seat capacity each would be required to accommodate the fleeced masses. But where would they all go to observe events and be acknowledged at once? No courtroom can accommodate 1 million victims. Even if Mass-Participation Court existed and were gaveled into session on an unbooked Saturday in Pasadena’s famous Rose Bowl with onetime Tournament of Roses Parade Grand Marshal and U.S. Supreme Court Associate Justice Sandra Day O’Connor coming out of retirement to preside, the huge stadium’s seating capacity of 92,542 still would be far too small to accommodate the injured parties. Beyond that, Greyhound’s entire noble fleet consists of only 1,200 buses, not the 20,000 that would be required to transport TelexFree victims to California. Despite the best efforts of the courts, victims are being lost as a result of these insidious MLM schemes. Some will be re-victimized in a whack-a-mole reload scam pitched by an MLM predator with a smile on his or her face and a Bible verse at the ready. There also can be no doubt that certain members of the “programs” are members of a criminal combine that, whether loosely or closely associated, pushes one racketeering scam after another on the consuming public. It is willful blindness on a global scale. It is so dangerous, so calculating and methodical, so gruesomely injurious to persons and property, that it almost defies description. Next time someone tries to recruit you into an HYIP “program” by telling you the “leaders” are already on board, here’s what to think: The racketeers are either running things or influencing events (again). They’re going to harm me (again). They’re going to harm my community, my country (again). They’re going to say they have been vetted by “attorneys” (again). Reclaim Your Brain — Right Now! Like predecessor scams such as AdSurfDaily and AdViewGlobal and Zeek, the hypnotized and robotic Stepfordians in Banners Broker who’d been brainwashed by cult tactics rose up to “defend” the “program,” including some individuals who continued to champion the scam even after it effectively extorted them into paying more fees to keep their positions intact and to retain any chance of receiving a payout. While trying to chill members who remained in control of their gray matter and hadn’t slipped into an MLM trance, Banners Broker naturally counted on the Stepfordians whose brains it had reduced to slush to wage efforts to chill Blogs and websites that report on scams. “If you know of a site with content that is negative towards Banners Broker, we ask that you report it to the Community Watch,” the “program” instructed in February 2014. 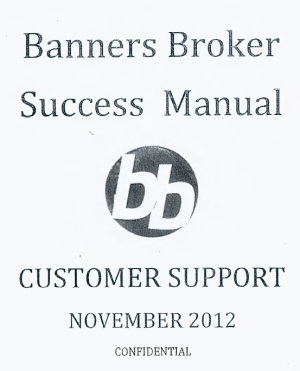 On Jan. 17, 2013, the PP Blog reported it was receiving menacing communications about Banners Broker. Also read about continuing efforts from the MLM HYIP sphere to destroy the antiscam well at BehindMLM.com and RealScam.com. NOTE: A special shout out today to RealScam.com and the Banners Broker Ponzi Scam Community on Facebook. They shared this 275-page court filing in Canada on civil and criminal investigations into Banners Broker. ALSO: Visit the website of the msi Spergel inc., the receiver. Quick note: More whack-a-mole: Just saw a Twitter promo targeted at Banners Broker and TelexFree members. The Get Easy logo includes a circle reminiscent of the circle into which Banners Broker inserted the letters “bb.” Only, instead of “ge” appearing in the Get Easy logo, some wispy white lines appear — very much reminiscent of the TelexFree logo. The color schemes of all three “programs” that incorporated a circle are approximately the same: white letters or symbols against blue.